Drought Hero is a specially treated biochar product, making dryland agriculture more resilient to water deficiency by improving soil moisture content or plant available water, and nutrient available water and nutrient holding capacity as well as root growth. At the same time, farmers can improve their productivity by minimizing water consumption and fertilizer use while gaining better and/or more stable yield. Meiwa Co., Ltd. produces this biochar through its patented carbonization technology*, by converting a wide range of unutilized biomass. Due to the increased number of drought and fluctuation of rainfall pattern, both associated with climate change, farmers have been facing low and/or unstable agricultural productivity more than ever. It has become a severe problem especially in the countries that hold arid and semi-arid lands (ASALs) such as the ones in Africa and Middle East Asia among other regions. In such countries, food security has been threatened both at micro- and macro levels. Application of the product does not require special infrastructure (such as irrigation pipes) or deep knowledge on how to use, hence its potential to be a ubiquitous solution for rainfed agriculture. Drought Hero, combined with our carbonization technologies for in-situ production, therefore serves as a great solution to the problem, enabling a viable way to realize Climate Smart Agriculture. Drought Hero has the porous strucuture and carbonized body which provide various characteristics which originate from . Note: While quantitative values differ greatly, (1) – (6) below are all key qualitative functions of biochar in common, including Drought Hero. Biochar absorbs and holds water within its porous structure, contributing to a more water-efficient agriculture. Especially arid and semi-arid lands are largely covered by sandy soil, which can easily lose water from the surface, making it difficult for plant roots to absorb. By applying biochar around the root systems, more water can be made available to the plants. Biochar has negative electric charge on the surface of its porous structure, attracting positive ions such as calcium, magnesium, potassium, etc. Biochar helps soil hold more nutrient and release them gradually. It contributes to constant supply of nutrients to plants over longer time period, which typically affect plant growth in a positive way. Moreover, by preventing nutrient loss, farmers can reduce the amount and/or frequency of fertilizer use. Application of biochar changes the soil microenvironment and affects the biota of the soil microbial community by promotes soil aggregation. Because of this advantage, biochar is used as compost accelerator. By mixing biochar into composting process, more nutrient-rich compost can be made within a significantly shorter period. In arid and semi-arid lands, soil pH tends to be acidic. Under such condition, nutrients become much less absorbable by most of plants. Since most biochar is alkalescent or alkaline, it neutralizes acidic soil and increases plant-available nutrients, contributing to better plant growth. Many scientific researches stress that biochar keeps its physical structure over very long time period (ranging from decades to 2000+ years). Unless it is physically destructed, some of its key features such as (1) – (3) will remain effective. Farmers can therefore consider the application of biochar as investment with long-term perspective rather than one-time consumption like fertilizers. Drought Hero works especially well in arid and semi-arid area where soil tends to be acidic and sandy, resulting in very poor water and nutrient holding capacities. Biochar can be simply added to plant root zone together with conventional fertilizer and/or compost. It does not require any installation of water facility nor radical change in conventional farming (except that usage of water and fertilizer will be reduced). Thus, biochar application is one of the most affordable and realistic means to improve drought resilience for rainfed agriculture practiced by both small and large farmers. You can upgrade a current local composting project. If biochar is mixed, composting process will be shortened drastically and ammonium-derived odour will be much less. The final compost product will be a better organic fertilizer and soil conditioner. In Western Kenya where we helped a grassroots NPO, their biochar-added compost product substituted the demand of chemical fertilizer by small-scale farmers because of its high yield and affordability. – Typically recommended application rate: 2-4 ton per hectare (optimal rate changes depending on crop type, soil and climate conditions etc.). The benefit is incremental, and some farmers would consider 20-60 tons per hectare as a threshold value from which benefits of further biochar addition would be less. – Way of application: mix the product when adding conventional fertilizer and/or compost to the soil. Put the biochar close to the plant root system and fertilizer and/or compost for maximum result. *Note: while general trends of physical characteristics remain unchanged with most types of biochar with wide range of actual values, chemical characteristics are specific to the current batch. *Analysis was done by third-party laboratories following the standard procedures stipulated by Japanese Fertilizers Regulation Act. Values above are typical for the current batch and may change without prior notice. Although the qualitative advantages of biochar do not vary a lot, their quantitative values differ depending on raw material, carbonization conditions and other factors. Below is an example of various specific areas of biochar, which is one of the key determinants of quantitative values for water holding capacity, bulk density, co-composting efficacy, etc. Its primary effects on drought mitigation. While polymer would improve soil’s water holding capacity, not all water will be utilizable by plant. If you compare plant available water, scientifically defined as the amount of water that can be taken by plants, our Drought Hero performed more than 50% better than a competitor polymer product in a laboratory experiment conducted in 2018. Its organic nature. Unlike chemical polymer products, ingredients of Drought Hero are purely from biomass and there is no addition of chemical during the production process (=carbonization). Life cycle. Physical structure of Drought Hero remains almost permanently unless it is physically destructed. Therefore, it is economical for users in the long run as some of the key features (such as increase of plant available water and nutrient holding capacity) remain. Drought Hero is a specific type of biochar produced by using Meiwa’s carbonization technology. We manufacture carbonization plants for export (see another page on UNIDO’s Environmental Technology Database). With such machines, you can locally produce biochar out of certain kinds of biomass such as dry sludge, animal waste, scrap wood, agricultural residue, food waste and water hyacinth among others (all to be very well dried in advance). Therefore, a more resource-efficient society can be built by installing such machines locally. *Currently available to specific countries only. Contact us for more details. Installation of a demo-size carbonization machine. Design of a laboratory- and/or field experiment to quantify the benefits of biochar on drought mitigation/crop yield improvement under client’s specific condition. Design of training on how to use biochar and/or make biochar-added compost for small-scale farmers. Technology transfer on local production of simple carbonization stove that yields small amount of biochar after cooking. 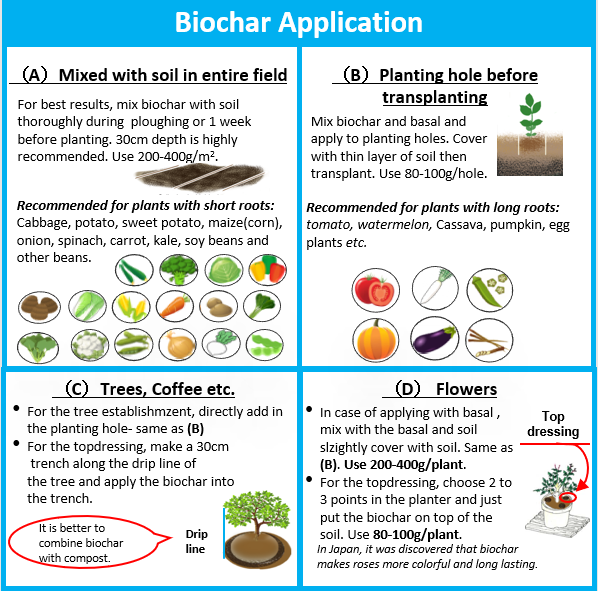 Application: Biochar was added with (also Meiwa’s product) into pits before planting coffee seedlings. About application method, see Fig. 1. The seedlings with biochar and wood vinegar look apparently bigger after several months. The owner of the coffee farm expects a better plant survival rate in case of water deficiency. He feels that since coffee plant requires abundant water in its early stage of growth, if drought happened, it causes direct financial pains for re-planting coffee seedlings and the forgone expected future gain. Due to biochar’s high water holing capacity, he strongly feels that coffee farmers would reduce plant death. He also added that coffee grade is highly affected by water availability especially in its early development stage. Therefore, he expects that biochar may even contribute to better coffee grade. 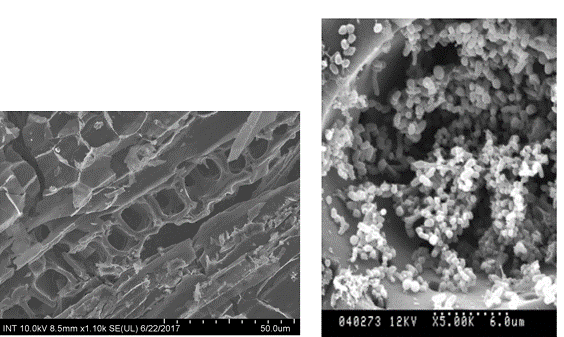 Application: Biochar was added to composting process to make biochar-added organic fertilizer. The small-scale farmer used it a few weeks before planting, instead of chemical fertilizer. Yield from the maize field with biochar-mixed compost was better than that of the field treated with conventional chemical fertilizer only (24 bags against 15 bags). Moreover, since the biochar mixed compost is produced with local materials, the purchasing cost was lower than that of chemical fertilizers imported from other countries. Application: A lot of biochar was first added to the field 30 years ago at the initial stage of tree planting. Since then, the farmer has been adding small amount of biochar. After 30 years of biochar application, the tree became thicker and healthier than average. The average size of a fruit is 1.5 times bigger and the number of fruits is twice as many as that of pear trees in neighbours’ farm. Application: Biochar was used as basal input together with animal waste compost and wood chips in a greenhouse flower farm (no chemical fertilizer is used). Biochar’s high water and nutrient holding capacities saved the amount of fertilizer topdressing and watering. It resulted in significant cost reduction. He estimated that the costs of such inputs decreased by half. It also reduced frequency of watering from once in two weeks to once in four weeks. He also noticed that the productive period of the flower was prolonged from 3 years to 4 years. Additional one year means a lot for the profitability of his flower business, such as reducing the need for new seedlings and the labour cost of planting. Meiwa Co., Ltd. has been selling biochar since 2016, while its clients of carbonization plants have been selling or using their biochar products by themselves since 1999. Typical users: commercial farmers of rice, fruits (grape, pear, olive, etc. ), vegetables (tomato, potato, turnip etc. ), flower (rose, alstroemeria, etc.) and households for kitchen garden use. Typical users: commercial farmers of rice, vegetables (broccoli etc.) etc. Drought Hero is certified by the Ministry of Agriculture, Forestry and Fisheries as a biomass-derived fertilizer with proven nutrient contents and no plant toxicity confirmed by third-party laboratories. It has also won several awards by a local government for its innovative and sustainable nature. Ⅲ. Agricultural research experiences with public, private and academic sectors. Improvement of plant available water and water holding capacity by biochar made under different conditions in collaboration with a Kenyan researcher. Field biochar experiment in Kenya for tomato, kale and coffee with university professors in Japan and Kenya under a JICA-funded project. Agricultural experiment and biochar analysis in detail for sludge biochar under Ministry of Agriculture, Forestry and Fisheries in Japan. Pilot-scale experiment of biochar addition to a garbage composting facility run by a private company. Joint researches in collaboration with a Japanese university, resulting in two paper publications. Also, even though Meiwa was not directly involved, in a bilateral research project in Botswana, Japanese and Batswana researchers quantitatively proved the benefit of biochar to improve the water holding capacity in dryland soil. The research outcome was published on Nature in 2016. Manufacturing of environmental plants, including biomass carbonization plants. Export of biochar and wood vinegar. *Local private partners currently available in several countries in Africa and Asia. We value partnership with local companies such as government consulting firms, trading companies, agricultural material suppliers and its distributors as well as NGOs, governments and international organizations. Expectation on such partnership typically includes not only promotion of Drought Hero and other biochar products imported from Japan, but also formulation of biomass carbonization projects with public organizations with our carbonization machines and expert network. We look for distributors to sell our Drought Hero and other biochar products in their countries. For the export of carbonization plants, we are seeking both sales representatives and distributors.